But is it wild or urban? The plant featured in this Street Plants post was a tough call. Is it urban or is it wild? It must be wild as it grows on the crest of the Laramie Range at 8500 feet elevation, enduring winds to 75+ mph and temperatures to -30º F (not counting wind chill). 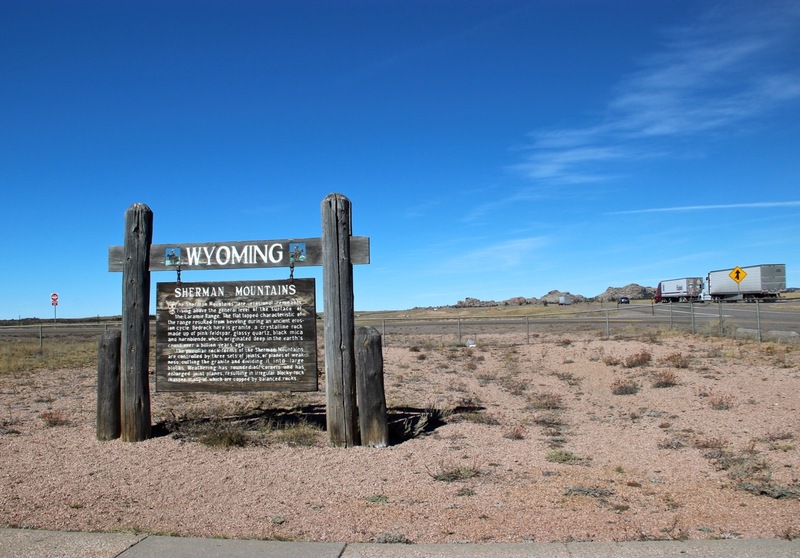 It got its start long before Euro-Americans arrived in southeast Wyoming. Yet it’s very much an urban plant, for it grows in the middle of Interstate Highway 80, one of the main arteries of America. 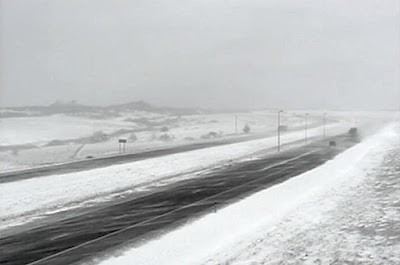 I-80 between Laramie and Cheyenne, Wyoming. Thin white bars on highway are trucks. Google Earth view. Back in the spring of 1868, a Union Pacific rail gang laid track past a small limber pine growing out of some granite rocks. They were in a hurry but took time to divert the tracks slightly to avoid the tree. Then they rushed on, laying one mile of track per day! They were bound for Promontory Point, Utah, where the Golden Spike was driven on May 10, 1869, completing the United States’ first transcontinental railroad. 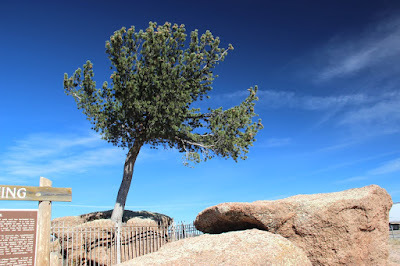 The small “struggling” pine by the tracks took on several names: Tree-in-the-Rock, Tree Rock, and Lone Tree. For 35 years, engineers would stop their trains to “give the tree a drink” in the form of buckets of water. But this tender loving care was not to last. “The Lincoln Highway was created to free automobile travelers from the confines of their urban environments, providing them a way, and a reason, to venture out toward distant horizons.” (source). 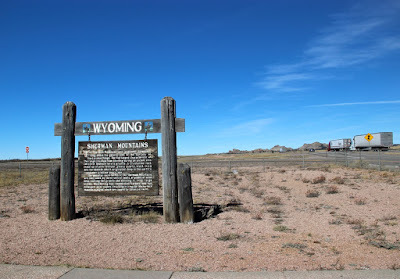 Distant horizons are common in Wyoming, so leave the confines of your urban environment and venture here! The Lincoln Highway in 1916. 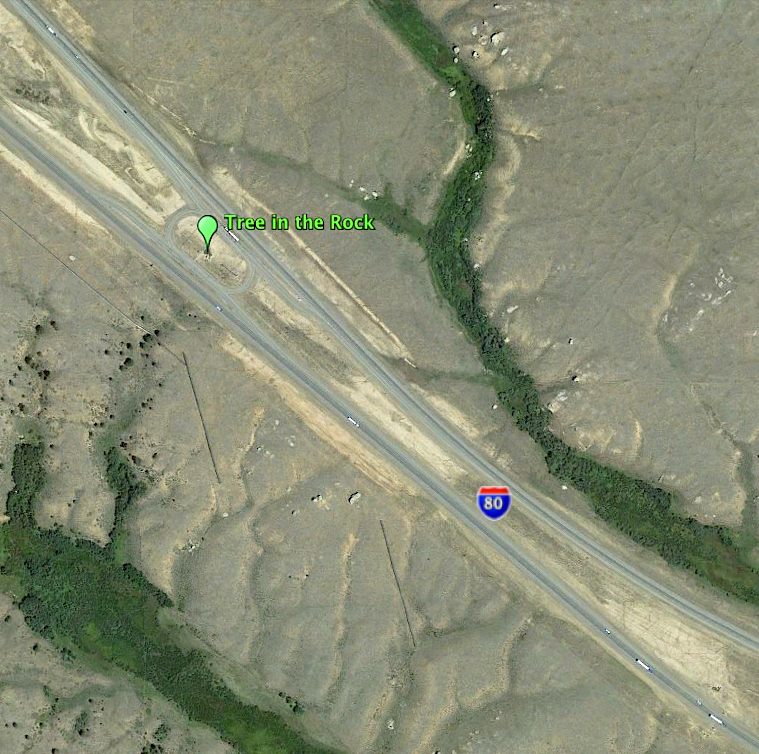 Added arrow points to the Tree-in-the-Rock's approximate location. The Lincoln Highway honored the great Abraham Lincoln, our 16th President, most famous for the emancipation of slaves. 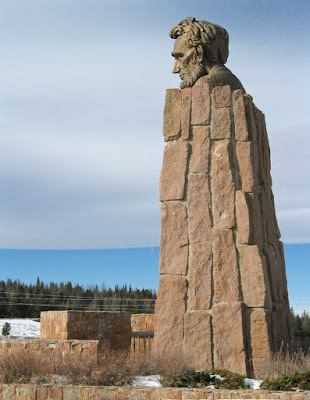 About nine miles west of the Tree-in-the-Rock, he looks down on Interstate 80 at the Summit Rest Area. 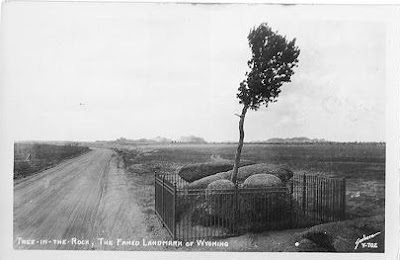 Post card of “Tree-in-the-Rock, The Famed Landmark of Wyoming” (ca 1927 based on similar dated photo). From Wyoming Tales, no source given. In the late 1920s, the Lincoln Highway became US 30. 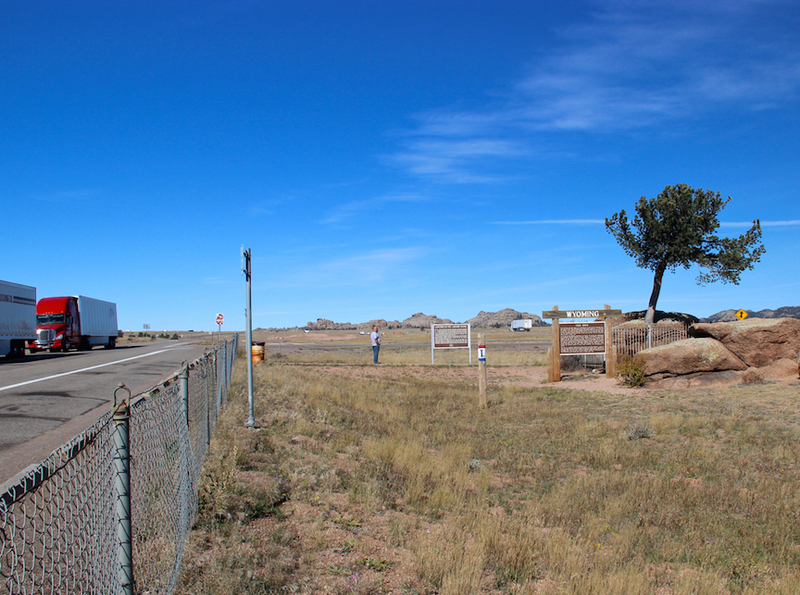 It was upgraded to Interstate Highway 80 in the 1960s. 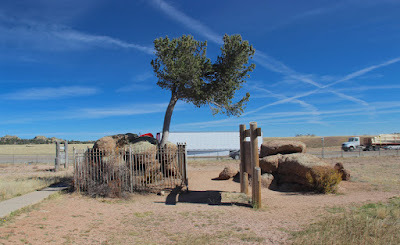 But the Tree-in-the-Rock survived. It had become so beloved that highway construction crews were forced to accommodate it. East- and west-bound lanes pass on either side, and there’s a small park for those with time to stop. As I mentioned, Interstate 80 (New Jersey to California) is a major artery. 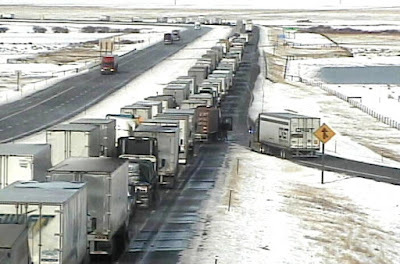 In southeast Wyoming, it's dominated by trucks carrying goods to those in need. These are the red blood cells of America. Sometimes the artery gets clogged; from WYDOT webcam near Laramie. 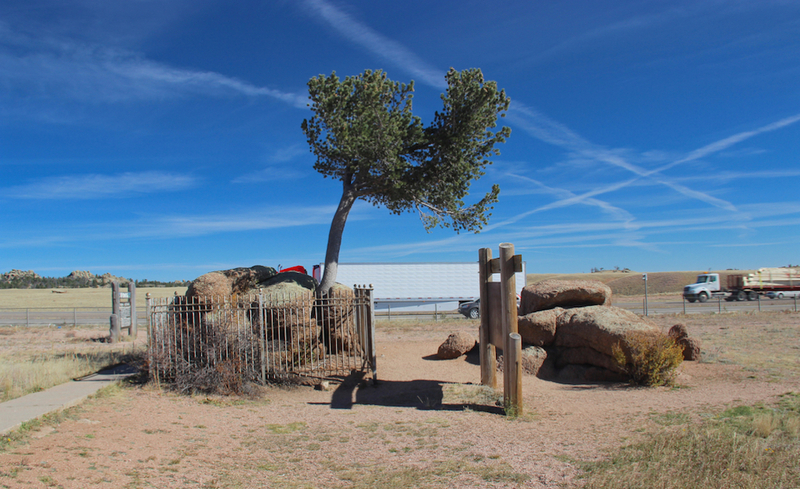 When I visited the tree last week, I struck up a conversation with a truck-driver, starting with what I was sure would be a good ice-breaker: “Would you like to see the tree in 1927?” I asked, showing him the old post card. It worked. We chatted about the tree, railroads, trucking, how scary I-80 is in winter, and whether those were mountains (his opinion) or rocks (mine) on the horizon. He lives on Chicago’s South Side, and was east-bound from Salt Lake City, Utah, to Des Moines, Iowa, and then back to Chicago. He covers 2400 to 2900 miles per week! Do we ever think about the folks that drive the trucks that bring us what we need, or more often want? I do—on cold snowy days when the roads are closed, or even worse, still open but with traffic at a crawl. What an awful but important job! A different view of I-80 near Lone Tree (WYDOT webcam). This driver stops to learn something of the country he passes through. “If you don’t stop, you never will,” he advises—words as pithy as any Yogi-ism. Truck driver in center of photo; his rig is the red one. 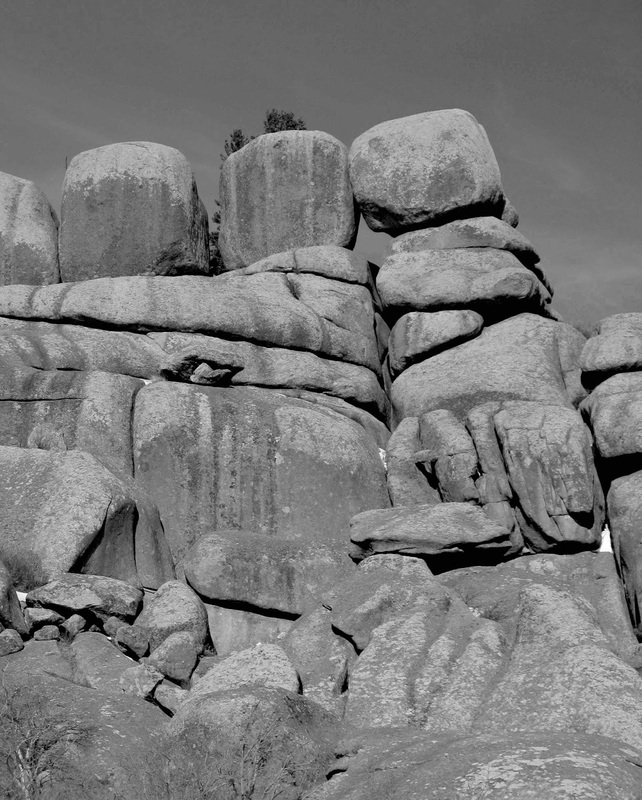 The photo above was the best I could do at replicating the old photo (note matching rock ridges on the skyline). Any further away and I would have been on the highway. 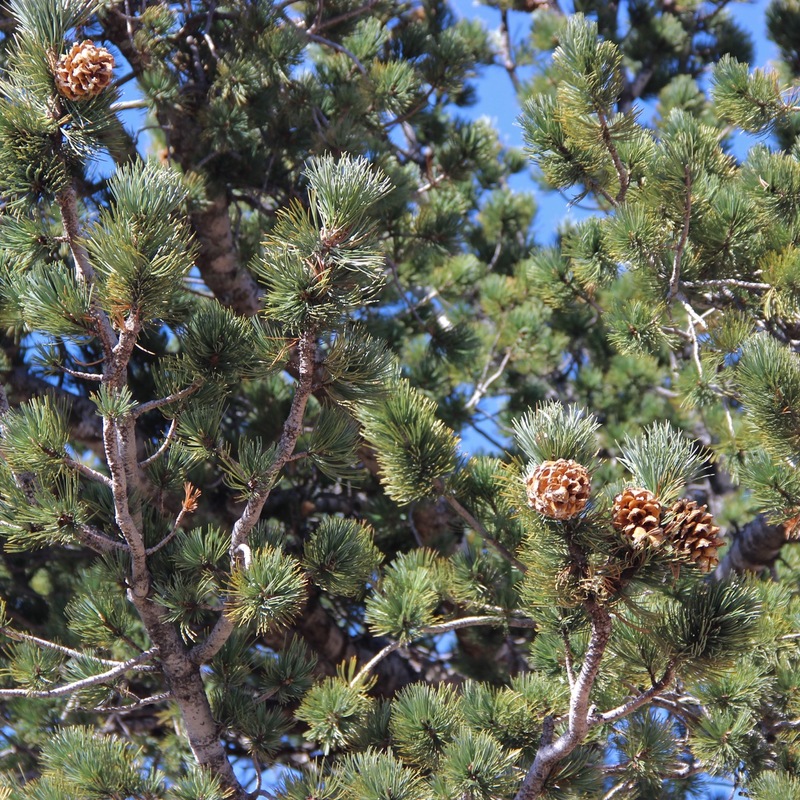 The limber pine has a healthier canopy now. Maybe travelers still stop to "give it a drink." 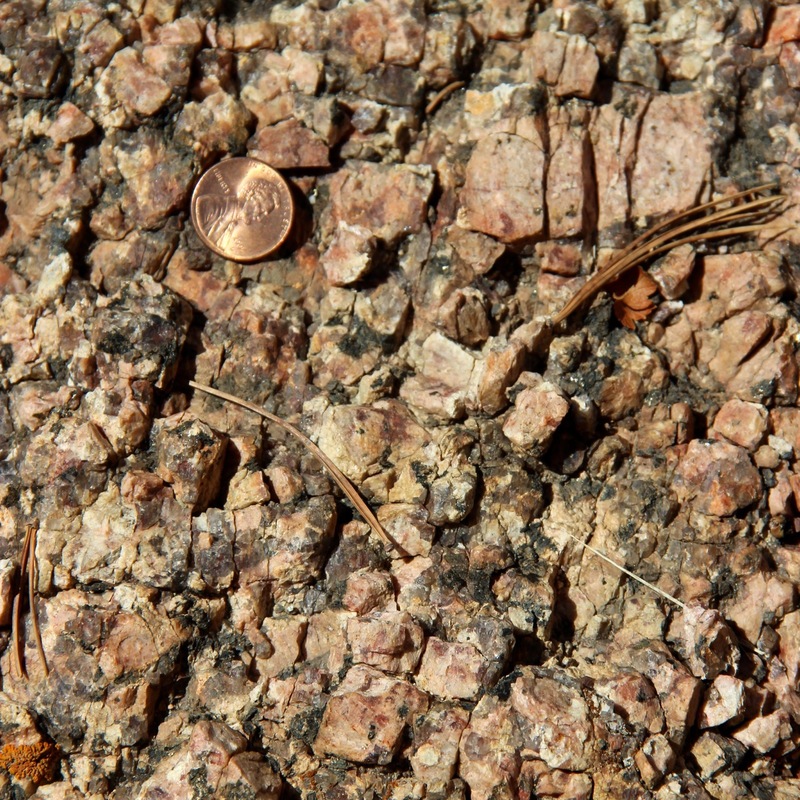 Limber pine (Pinus flexilis) in late Proterozoic (1.4 billion years old) Sherman granite. 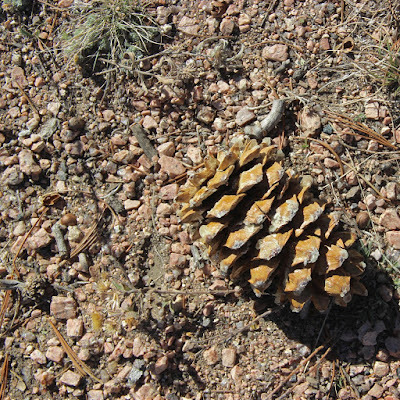 It’s producing cones, a good sign. 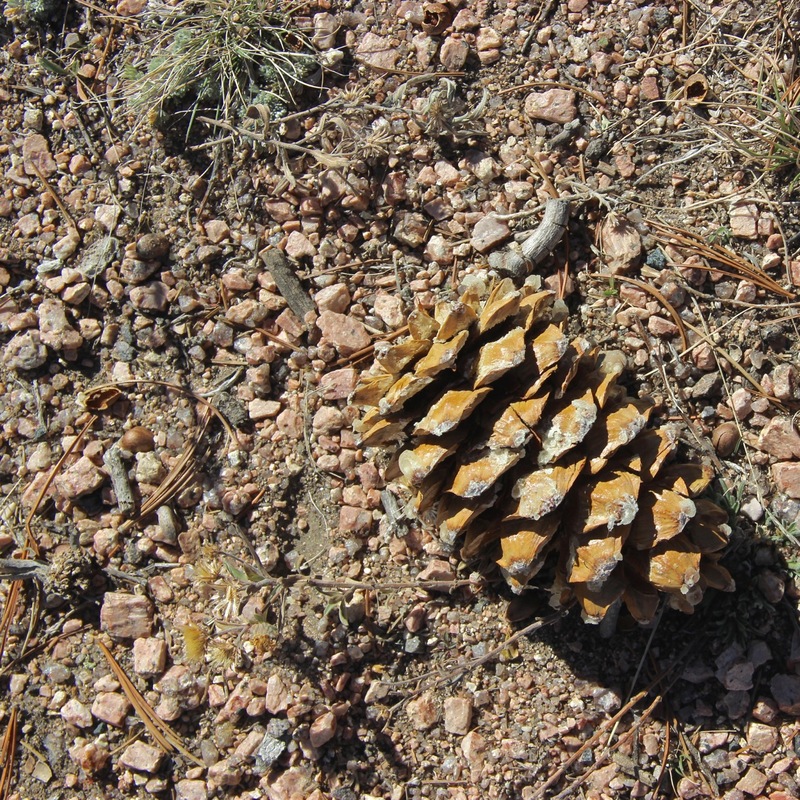 Limber pine cone on grüs—disintegrated Sherman granite. 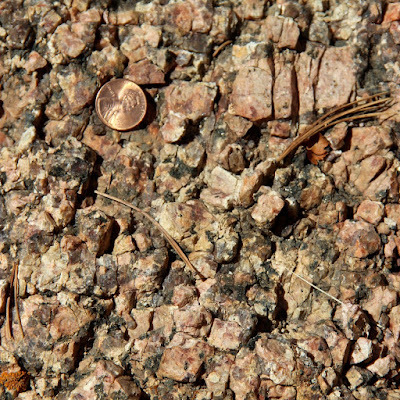 The coarse-grained Sherman granite, with Abe Lincoln for scale. Lincoln Highway marker on left. Are those rocks or mountains on the horizon? The tree-in-the-rock-in-the-road is on the “crest” of the Laramie Mountains. 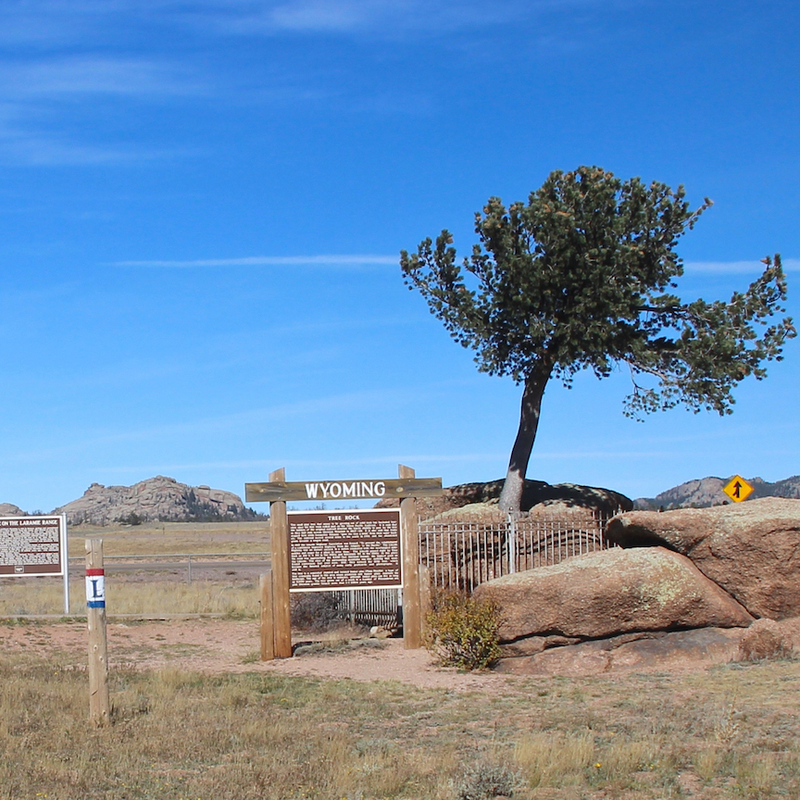 It’s an odd crest—a flat tilted plain with scattered towers, ridges, walls and rock piles, all made of giant granite blocks. It looks like a playroom for a giant's children, where no one has cleaned up and put the blocks away. These are the Sherman "Mountains"—geologists call them “tors.” I’ve written multiple posts about them as they’re fascinating and irresistibly photogenic. This will be my contribution to the Street Plants gathering on October 21. Have you had a recent encounter with urban wild plants? Consider joining us (stay tuned). This is one of the most interesting posts I've read - ever. Thanks so much, Lucy. I appreciate your encouraging comment! What a great find. It reminds me of the poem 'The Rose That Grew from Concrete'. I always find it amazing when plants survive where we often think they shouldn't! 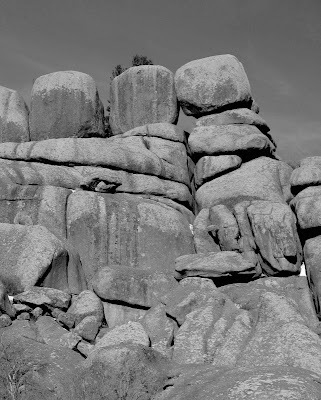 The Sherman mountains remind me of the Cheesewring, which is also a granite tor in Bodmin Moor, Cornwall.